Olivia Munn had a busy weekend in LA attended the F*ck Cancer Gala on Saturday(October 13th) at the Warner Brothers Studio Lot and the #GirlHero Awards Luncheon on Sunday(October 14th) at the SLS Hotel. 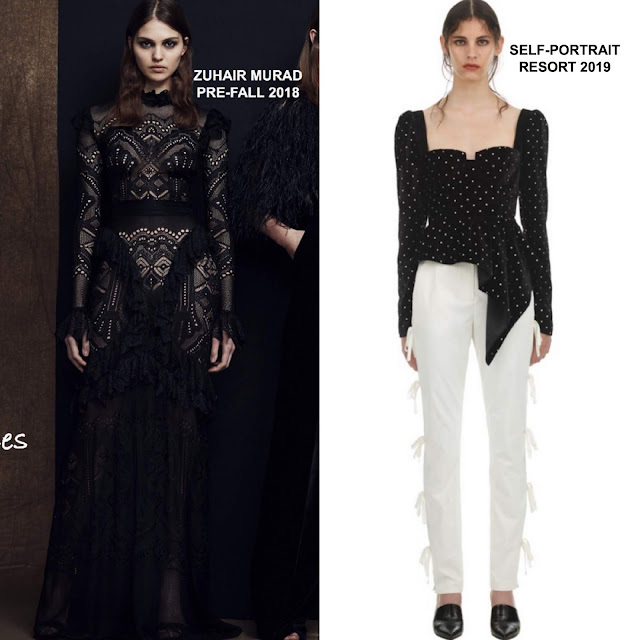 For the F*ck Cancer Gala, she wore a ZUHAIR MURAD PRE-FALL 2018 long sleeve black ruffle knit dress which was partially lined for coverage and featured a cinched waist. She finished up her look with center part tresses and minimal make-up. At the #GirlHero Awards Luncheon in which she was one of the honorees, she wore another all black look courtesy of SLEF-PORTRAIT. Her RESORT 2019 asymmetrical velvet diamond fringe top was teamed with velvet wide-leg pants. The pants needed to be hemmed but the look is still cute. Silver sparkly jewelry and a ponytail finished up her look.